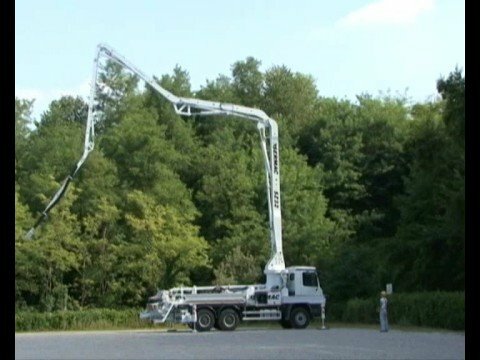 The Utranazz range of concrete pumps for hire are available in a wide range of sizes with boom lengths from 21 to 66 metres and concrete outputs of up to 185m3/hour at pressures of up to 80 bars. They are available with either a 3, 4 or 5 section placing boom with the option of ‘z’ fold, ‘roll’ fold or ‘multi-z’ fold opening, making them easy to manoeuvre and suited to all types of concrete placing work, even where space is restricted. These truck-mounted concrete pumps for hire utilise an innovative ‘S’ valve, which guarantees excellent outputs under hard working conditions. Each unit is fitted with hydraulically operated stabiliser feet to ensure quick and safe placement of the pump at all types of job sites.